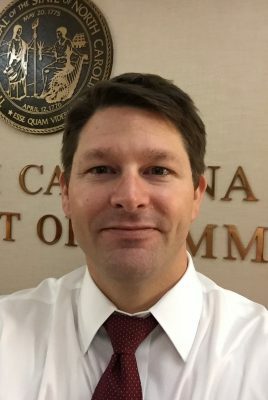 Will Best joined the North Carolina Department of Commerce in 2003. Best has worked in the areas of geographic information systems (GIS), regional and community planning, military joint land use studies and government policy. Best, who is from Carteret County, is the project manager for the Seymour Johnson AFB and Dare County Range Joint Land Use Study (JLUS). This Department of Defense funded study directly involves eastern and northeastern North Carolina counties that are impacted by Special Use Airspace (SUA), Military Training Routes (MTRs) and Military Operations Areas (MOAs). The majority of the study area counties have biological resources such as wetlands or migratory corridors and maritime environments that contribute community and economic development.